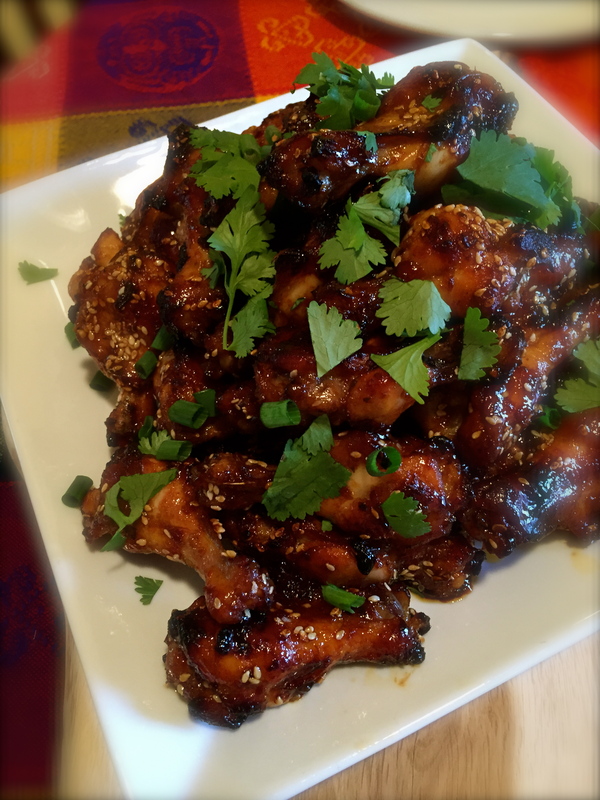 Not my first Thai chicken recipe, and I’m sure it won’t be the last, but loved the tart, slightly sweet and hint of spice these wings provided. Get out the napkins! Mix all marinade ingredients together and pour half over chicken wings. Allow to marinate for 30 minutes, up to overnight. Put the rest of the marinade in a small saucepan and bring to a boil over medium heat. Reduce by about half and set aside. Lightly grease, or line a baking sheet with parchment paper. Put wings on baking sheet in a single layer. Roast for 20 minutes, then remove and toss in a bit of reduced marinade. Sprinkle sesame seeds & sea salt over and roast for a further 20 minutes until shiny and crispy. Garnish with cilantro, green onion and more sesame seeds. I don’t think I can have enough chicken wing recipes. These are perfect if you are looking for a sticky, slightly spicy, chicken wing. Make sure you have plenty of napkins handy, you will need them. If you like them extra spicy, just use more of the chile paste. Using a ziplock bag, mix all ingredients except chicken wings. When all ingredients are blended add the chicken and give it a good massage. Put entire bag in the fridge for at least 3 hours. While chicken is baking, whisk to combine all sauce ingredients in a heavy bottom saucepan and bring to a boil. Reduce heat to medium and allow to thicken. Brush over chicken (or toss in a bowl to evenly coat) and return chicken to oven for another 5-10 minutes until crispy and browned in spots. Garnish with sesame seeds and slivered onions. These chicken wings hit all the notes: spicy, sticky, salty, sweet and tangy – grab the napkins and dig in! Sweet, spicy, tangy, sticky – what’s not to love? Blend this all together and taste. TASTE – I can’t say this enough – every brand of seasoning is different, whether your garlic & ginger is fresh … everything leads to a different flavour profile. When you taste this sauce, you should want to keep dipping for another taste ……… if not – keep adjusting until you can’t stop. Put chicken wings into a ziplock bag, and add just enough sauce to coat. Reserve the rest. 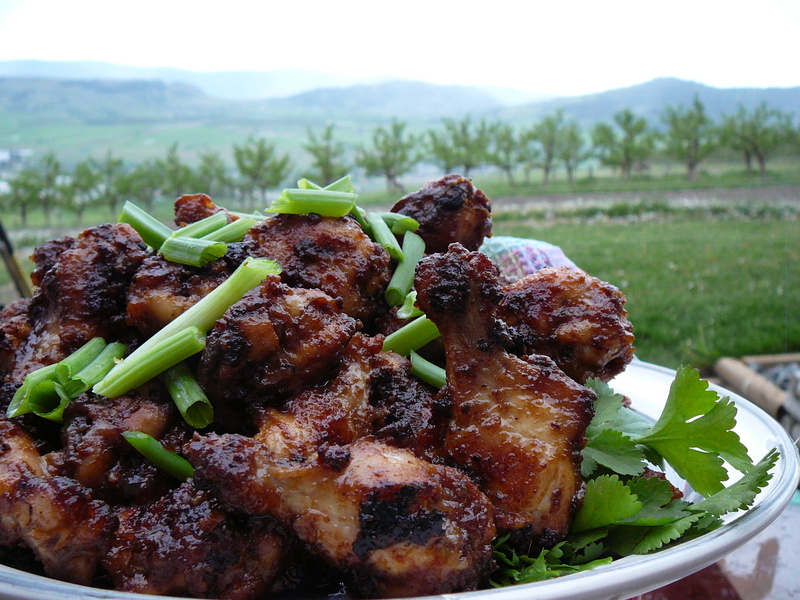 Marinate chicken wings for as long as you have available – works well whether you have 24 hours or just 1. Roast chicken wings in hot oven (400 degrees) until cooked through – we like ours well done – around 35 minutes. While chicken is cooking, reduce reserved marinade seasoning until thick and glossy. When cooked through, toss cooked chicken wings in reduced marinade, add 2 tbsp toasted sesame seeds. Return to oven and roast until crispy and glossy – along with super sticky and delicious! Garnish with roughly chopped cilantro and green onions. Check out my post for Thai Noodle Salad with Chicken and Peanut Lime Dressing …. leave out the chicken on that salad and serve this with with the Thai Chicken Wings …. perfection! Marinate chicken wings for as long as you have available – Remove from marinade (reserve marinade) then bake on a rack in preheated oven (400 or 425 convection) until golden brown and crispy – at least 30 minutes. Heat the marinade in a small saucepan until it boils and reduces slightly. When they are starting to get golden brown and crispy, toss them in the reduced marinade and put back on rack to get all crunchy. Garnish with chopped peanuts and cilantro. Toss well and turn onto baking tray (works really well if you cover baking tray with parchment paper, and you also reduce your clean up time!) Reserve the sauce. Bake @ 400 for 30 minutes, turn and bake another 10. Return wings to sauce and toss once more – baking for another 15 minutes until they start to crisp up.